BRGY MAGSAYSAY, Lope de Vega, Northern Samar – Due to the accurate and timely information given by peace loving residents in the area, the troops of 20th Infantry (We Lead) Battalion, 8ID, PA under the leadership of LTC Noel A. Vestuir has again seized NPA encampments at Barangays San Julian and Trangue all of Catarman, Northern Samar last November 22 and 23, 2011 respectively. According to LTC Vestuir, 20IB’s Commanding Officer, civilian informants in the area has tipped-in information about the presence of armed Communist Terrorists (CTs) that are conducting house to house visitation and collecting food stuffs from the residents in the barangays located the boundaries of Bobon and Catarman of Northern Samar. Reacting to the said information, 20IB has sent troops to verify the reported presence of the CTs in the area. On November 22 2011, 20IB troopers led by 2LT Al Peter Galula (INF) PA discovered an abandoned enemy camp at vicinity Brgy San Julian, Catarman, Norther Samar. The said encampment can accommodate more or less twenty (20) CTs and was abandoned after the NPAs left the place to avoid armed confrontation with the government troops. In related development, the pursuit operations conducted by the government troops has resulted to a series of two (2) encounters at Barangay E Duran of Bobon and Barangay Trangue of Catarman all of Northern Samar last November 22 and 23, 2011 respectively. As a result, the operating troops led by 2LT Jec McWill Santos (INF) PA were able to overrun another CT camp at barangay Trangue on November 23, 2011 at around 1:30 in the afternoon. The troops also recovered personal belongings and empty shells of different types and calibers of ammunition left behind by the fleeing CTs. No one was hurt in the government side while it could not be ascertained that there were scores of wounded in the NPA side due to the bloodstains that were seen in the encounter site. Meanwhile, LTC Vestuir commended his troops for another successful feat as they continue to perform their mandate of protecting the people. He also appreciated the action of the mentioned civilian who provided the timely information on the activities of the CTs in their barangay. Based on the account of the civilians in the area, the NPAs in the 1st District of Northern Samar could no longer hide from the pursuing government forces considering that even the civilians who they claimed to be their “masa” are squealing their location. “The NPAs has no way to run. They can no longer hide and even no longer safe with the masses they believed to be theirs. We will continue to pursue them and so that they will be forced to abandon their armed struggle for them to return to the folds of law and once again live normal and decent lives along with their families. As I commend my troops for their successful deed of executing their mission, I would also like to recognize the support of the local folks for without it, our mission would not be carried out successfully”, says LTC Vestuir. “I also attribute this success to our people because for every violent enemy activity pre-empted by our troops, it creates a secured environment for the peace loving communities in our area of operations”, Vestuir added. He also calls on the people to report any person, wounded or not, that are seen in their barrio since the 20IB is openly willing to provide assistance to them at any cause. “We once again solicit support to our people to report to us any wounded person that you believe to be part of the said encounter. We are willing to help them and provide the necessary assistance and I am assuring them that they will never be harmed”, Vestuir concluded. CATBALOGAN CITY – Samar’s accomplishment to its commitment to this year’s National Greening Program (NGP) has reached 88% as of November 15, 2011. This was bared by the Samar Provincial Environment and Natural Resources Office Information Officer Melyn Godin during a meeting of the provincial Small and Medium Enterprise Development Council (SMED). This was affirmed by the PENR Officer himself, Mr Elpedio Simon in a subsequent interview. PENRO Simon had another better news. “The people’s organizations implementing the tree planting have committed that they will be able to accomplish 100% before the end of the year,” Simon said. The NGP is embodied in Executive Order Number 26 where the Aquino government is committed to plant some 1.5 billion trees until 2016 to give livelihood opportunities and to mitigate the effects of climate change. PENRO Simon said of the 1,460 hectares targeted for this year, some 1,295 hectares have already been planted. These areas are found in the towns of Basey, Hinabangan, Calbiga, Paranas, Taranganan, Gandara, San Jose de Buan, Motiong and Jiabong where there are established People's Organizations. Meanwhile, in Catbalogan City, during the civil service anniversary, all stakeholders moved as one to plant two thousand trees in Barangay San Vicente, Catbalogan City. The Civil Service Commission (CSC) with the city government, PENRO, schools and even civic groups and the media joined forces for the greening program. INTERNATIONAL WATERS – Activists from the Greenpeace ship Esperanza interrupted an illegal transhipment and demonstrated against illegal fishing in a tuna-rich area called the Pacific Commons. The illegal, unregistered purse seine vessels were caught fishing and transhipping in international waters near Indonesia, an area closed by the Western and Central Pacific Fisheries Commission (WCPFC) and the island nations’ governments to purse seine fishing due to ever depleting fish stocks. An unnamed vessel with no flag or nationality, but manned by Filipino crew, was caught illegally transhipping its catch to another carrier vessel, the Lapu-Lapu. "It is galling and completely unacceptable that these vessels and their owners violate efforts by the region to protect our tuna stocks, which is key to food security and economic development for many people in the region. Such operations undermine efforts to ensure tuna stocks in the Pacific recover from overfishing and also threatens the lifeline of the legitimate fishing industry including Filipino fishermen," said Mark Dia, Philippine country representative of Greenpeace Southeast Asia. "We call on the members of the WCPFC to take action on these vessels, prosecuting the vessel owners and blacklisting them from further fishing. In particular the Philippines' Bureau of Fisheries must support the extension of the closure of the Pacific Commons to all fishing activities if it is serious about putting an end to pirate fishing. They must also support the ban on Fish Aggregating Devices (FADs), as well as in cooperating with other nations in the region to improve measures in enforcing marine protection," said Lagi Toribau, Greenpeace oceans campaigner on board the Esperanza. Greenpeace is currently engaged in its "Defending Our Pacific" expedition, a campaign to stop the unsustainable plunder of Pacific tuna by ending the use of destructive fishing practices and illegal fishing, and through the creation of marine reserves in the Pacific Commons. Activists on board the ship have also removed three illegal floating FADs found in the Pacific Commons. With tuna stocks in other oceans now depleted, fishing fleets from Asia, USA, and Europe have turned their attention to the Pacific, the source of more than half of all tuna consumed globally. “Pacific bigeye and yellowfin tuna stocks are in ever deepening trouble. Purse seine vessels are largely to blame due to increasing commercial proficiency in catching tuna. Large-scale tuna purse seiners can take in two days what it would take local fishermen an entire year to catch. In addition, purse seiners use FADs that entice fish – including already vulnerable juvenile bigeye and yellowfin tunas, sharks, turtles and other marine life – to a single location to be scooped up by purse seine nets,” said Mr. Toribau. Pirate fishing is known to be particularly rampant in the high seas and areas such as the Pacific Commons, where monitoring and surveillance are difficult. It is estimated that between 21-46% of all fish caught in the Pacific is taken by pirate fishing ships such as this one. “This case clearly demonstrates the urgent need to close the Pacific Commons to all fishing and ensure regional enforcement is ramped up. In addition, seafood companies must end their complicity in this kind of crime by refusing to source tuna from the Pacific Commons,” Toribau added. Greenpeace is campaigning for a global network of marine reserves covering 40% of the world’s oceans and for a more sustainable fishing industry. Greenpeace is working with retailers across Europe, Australia and the Americas to increase the market share of sustainably-sourced tuna. Gary Liberal, R.N., spokesperson of the Morong 43 and one of the plaintiffs named in the civil suit filed on April 4, 2011 against GMA, et. al. at the Quezon City Regional Trial Court, reminded the Aquino administration that it should not forget the victims of human rights violations such as the Morong 43 case committed under GMA’s term. Seven months since they filed a civil suit suing for damages totaling P15 million for physical and psychological torture and other forms of indignities they suffered during their illegal arrest and detention, the case has not moved beyond the first and last hearing on June 2011. Defendants named in the suit are former President Gloria Macapagal-Arroyo, former Defense Secretary Norberto Gonzales, former Chief of Staff Gen. Victor Ibrado, Gen. Delfin N. Bangit, former commander of the 2nd Infantry Division (ID) Gen. Jorge Segovia, commander of the intelligence unit of the 2nd IDPA Lt. Col. Cristobal Zaragosa, 2nd IDPA Warden Major Manuel Tabion, commander of the 202nd Infantry Batallion (IB) Col. Aurelio Baladad, 16th IBPA commander Lt. Col. Jaime Abawag, and Rizal Provincial Police Office commander P/Supt. Marion Balolong. Liberal added that while they had to go on a hunger strike, get punished in jail for holding noise barrage, and file numerous requests in court to assert hospital confinement for two of their pregnant colleagues Judilyn Oliveros and Mercy Castro in the Philippine General Hospital, GMA was graciously allowed by the court and authorities to be on “hospital arrest” without dropping a sweat. Her aces may be well laid in the Supreme Court but we have the people’s movement behind us – the very force that make the wheels of history turn, Liberal added. TACLOBAN CITY – The Sangguniang Panlalawigan, during its regular session on November 22, unanimously approved the P1,387,000,000 Annual Budget of the province of Leyte for the year 2012. The budget was passed without much discussion on the floor because the same has already been deliberated upon by the august body before the session, the chairman of the SP committee on Public Information and vice chairman of the committee on Finance and Appropriation Board Member Roque Tiu told the media practitioners covering the Capitol. Gov. Carlos Jericho L. Petilla submitted to the Sangguniang Panlalawigan (SP) on October 13, the 2012 Annual Budget of the Provincial Government of Leyte for the consideration and eventual enactment of an appropriation Ordinance pursuant to the Local Government Code (RA 7160), Board Member Tiu of the 1st District of Leyte, said. The approved Executive General Fund Annual Budget of the Provincial Government of Leyte for Fiscal Year 2012 has a total appropriations amounting to P1,387,000,000. The revenue sources are estimates from the Internal Revenue Allotment, Local Taxes/Receipts and from the Unappropriated Surplus as of December 2010 Beginning Balance. As stated by Governor Petilla in his Budget Message, it is still the priority of his administration to pursue on top Information and Communications Technology, Tourism Development, Livelihood for youth with values formation, and improved health care through upgraded hospital facilities and personalized services. The expenditure program of the Provincial Government of Leyte by sector showed that the biggest share in the pie goes to Health, Nutrition, Population and Social Welfare at 22.20%; followed by General Public Services at 18.23%, Development Funds at 16.48%, Special Purpose Appropriations at 13.92%, Economic Services at 11.44%, Statutory and Contractual Obligations at 8.04%, LDRRMC Fund at 4.61%, Special Programs, Projects and Activities at 4.33% and Aid to Barangays at 25%. The approved budget, according to BM Tiu, is more than P110M over and above the 2011 budget of P1,277,000,000, despite the 4.7% decrease of the IRA as announced by the Department of Budget and Management due to the 2009 shortfall of Internal Revenue collection. This is due to the surplus of 2010 budget in the amount of about P108M, the decrease for 2012 budget was offset with the accumulated 2010 budget savings according to Ms. Gina Hipe, the Provincial Budget Officer. The IRA for 2012 for the Province of Leyte is P1,143,000,000 while that of the 2011 total IRA is P1, 190,000,000 or about P47M lower between the 2011 and 2012 IRA. Due to the sound fiscal management and good governance of the Provincial Government headed by Gov. Petilla, the delivery of basic services as well as the implementation of priority Programs and Projects of the province will continue and is assured, BM Tiu said. QUEZON CITY – Families of victims of extrajudicial killings, enforced disappearances and other human rights violations joined the activities set today on the second year commemoration of the Ampatuan massacre, also declared as the International Day to End Impunity. “We share with you the pains of the long wait for justice. We should not stop, however long this may take, until justice is served,” Hustisya secretary general Cristina Guevarra said. Some of those who joined the march were victims of killings both under the Arroyo and Aquino governments, like Evangeline Hernandez, mother of slain human rights worker Benjaline Hernandez and Glenda Co, wife of slain botanist Leonard Co.
Also in the march are families of victims of enforced disappearances. Under the Arroyo government, there were 206 desaparecidos. Meanwhile, the 57 victims of the Ampatuan massacre belong to the 1, 206 victims of killings under Arroyo, in which none have been prosecuted to this day. “They are all proof that such impunity continues to this day,” Guevara said. Victims group Hustisya again demanded the Aquino government to file charges on human rights violations against Cong. Gloria Macapagal-Arroyo next, after the former president was charged with electoral sabotage last week. “The Aquino government should now deal with the cases of human rights violations committed when Arroyo was commander-in-chief of the state forces. There are no Ampatuans if Arroyo did not coddle warlords and private armies,” Guevarra said. According to the group, the government should not “sit on the fence” until Arroyo tries another attempt to elude trial. “As long as the Aquino government does not hold Arroyo accountable, along with the former president’s cohorts like retired army major Jovito Palparan, and as long as the killings continue, we shall equally demand his accountability,” Guevarra ended. Cayetano: Protect our journalists, end impunity, pass the FOI bill! PASAY CITY – Senate minority leader Alan Peter Cayetano called for an end to impunity in the killings of journalists in the Philippines. He lamented the unabated spate of killings against members of the media as he recalled the gruesome Maguindanao massacre that killed 57 civilians, 31 of which are journalists, marking its 2nd year anniversary this month. “It is alarming to see that the perpetrators of this most heinous crime, deemed as the single most deadliest event for journalists in history, have yet to be brought to justice,” said Cayetano. The senator pointed out that the failure of the justice system to prosecute perpetrators behind other deaths of members of the media has led to a total of 11 journalists being killed in the Aquino administration’s 2 years of power. “Jose Daguio, Miguel Belen, Edilberto Cruz, Edison Flameniana Sr, Doc Gerry Ortega, Cirili Gallardo, Len Flores-Sumera, Romeo Olea, Niel Jimena, Johnson Pascual and Roy Quijada Gallego are the 11 journalists whose deaths have yet to be served by justice,” he said. “How many more do we not know about? How many more do we have to see before we act?,” he asked. He also linked journalist killings to the failure of Congress to pass the Freedom of Information (FOI) bill that provides access to government information including transactions and contracts that will prevent corrupt practices. "Most of the killings of journalists are linked to their expose' of corruption cases by many unscrupulous local government officials," said Cayetano. He added that once the FOI Act is in place, journalists need not sacrifice their lives and the security of their families in the name of truth and freedom as FOI guarantees transparency and accountability in government transactions. 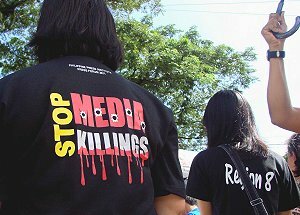 The minority leader said it is a disgrace to the nation that the United Nations Educational, Scientific and Cultural Organization (UNESCO) and the New York based Committee to Protect Journalists (CPJ) ranked the Philippines as the third most dangerous countries for media practitioners, next only to Iraq and Somalia. He also noted the findings of Brussels-based International News Safety Institute (INSI) that determined there are seven journalists who die every year in the Philippines and 85 per cent of these killings, the villains remain unpunished. "Journalists, who are supposed to be the vanguards of truth and freedom in the society are now under attack and this only reflects the failure of our justice system. How can we say that we are a free country if we can’t even protect those who promote free press?," said Cayetano.